Medium-sized tree 12 - 18 m tall, trunk diameter 30 cm - 0.6 m Leaves: opposite, pinnately compound, 25 - 30 cm long, with seven to nine leaflets. Leaflets short-stalked, yellowish green, 7 - 15 cm long, 2.5 - 4.5 cm wide, oblong lance-shaped to egg-shaped with a tapering base and long-pointed tip, slightly toothed, thin, firm, and hairy on both surfaces. Leaves turn yellowish brown in autumn. Flowers: either male or female and found on separate trees (dioecious). The tiny purplish or greenish flowers are borne in a downy, branched inflorescence. Calyx cup-shaped. Fruit: dry, single-seeded, winged (samara), 2.5 - 5 cm long, and narrow-cylindrical. Wing encloses half or more of the seed cavity. Bark: brown or dark gray, thick, and furrowed into scaly, interlacing ridges. Twigs: stout and ashy gray to reddish brown. Current shoots may be densely hairy at first (persisting one to three years). Leaf scars crescent-shaped with a concave top, containing several bundle scars that form a U. Surface layer of older, hairless twigs not peeling or flaking. Buds: dark brown, small, rounded, and finely hairy. Terminal bud 3 - 8 mm long. Uppermost pair of lateral buds adjacent to terminal bud at nearly the same level. Form: rounded to irregular and densely branched. Trunk straight, stout, and sometimes slightly expanded at the base. Similar species: The other ash species of the Chicago Region look more or less similar to Fraxinus pennsylvanica. Fraxinus americana differs by having pale or whitish undersides, twigs with raised leaf scars, and a twig surface (except current year's growth) that is flaky, scaly, or peeling. Also, the wing of its fruit does not extend to the base of the large seed cavity. Fraxinus nigra has stalkless leaflets, and the wing of its fruit nearly extends to the base of the flat seed cavity. Fraxinus profunda has longer, wider, and more leathery leaflets. It also has densely hairy shoots (current), and the wing of its fruit often extends to the base of the seed cavity. Fraxinus quadrangulata has square twigs, and the wing of its fruit extends to and around the base of the seed cavity. Habitat and ecology: Frequent in woods, usually not far from water. Notes: Fraxinus pennsylvanica is the most widely distributed native ash in North America. It has both hairless (called green ash) and hairy (red ash) forms, observable on twigs, leaf parts, and flower and fruit branchings. The hairless form, green ash, is often planted as an ornamental. The wood of F. pennsylvanica is used for tool handles, interior finishing, furniture, oars, paddles, tennis rackets, and baseball bats. The emerald ash borer (Agrilus planipennis) is a serious insect threat to all native ashes (see link below). Etymology: Fraxinus is the Latin word for ash. Pennsylvanica means "of or from Pennsylvania." In dry or moist soil, usually on or near the banks of streams and lakes. [Deam recognizes F. lanceolata as a distinct species that has glabrous branchlets rather than velvety-pubescent as in F. pennsylvanica sensu stricto. This form is] frequent and locally common in low ground along streams, in swamps, and in low woods. It often forms a complete stand. Its most constant associates are white elm and soft maples. Tree to 25 m; bark flaky; lfls 5-9, usually 7, lanceolate or lance-ovate to oblong or elliptic, acuminate to a blunt or acute tip, serrate to crenulate or subentire, not papillose beneath, acute or broadly cuneate and often inequilateral at base, usually ±decurrent onto the short petiolule or subsessile; twigs and lvs densely pubescent to often glabrous; terminal bud acute, higher than wide; lf-scars with truncate or barely concave upper margin; anthers of no. 1; fr linear to spatulate, the wing extending to about the middle of the body, its free part, above the terete or subterete body (this mostly less than 2 mm wide) commonly shorter than the body itself and 3-8, usually 5-6 mm wide; cal 1-1.5 mm, usually cleft on one side; 2n=46. Moist or often wet woods; N.S. and Que. to Alta., s. to Fla. and Tex. (F. campestris) Typical F. pennsylvanica, with the twigs, infl, and lower surfaces of the lvs densely hairy, is called red ash. 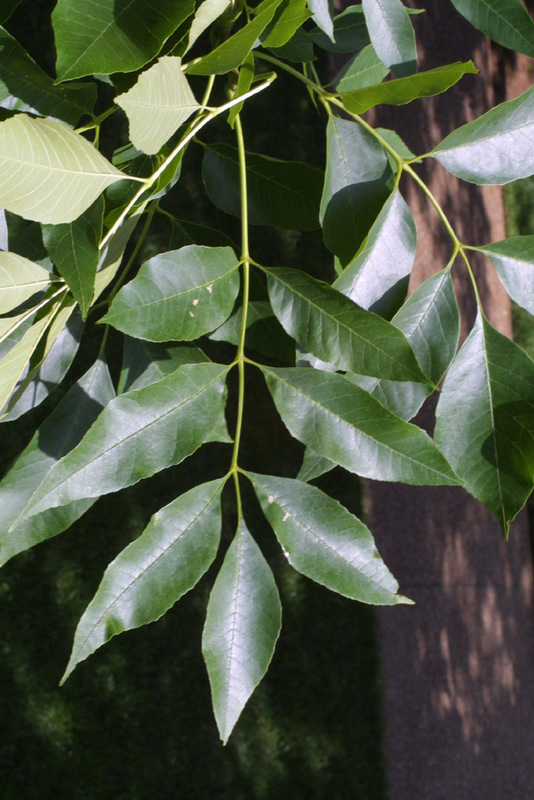 Glabrous plants are called green ash; these have been segregated as var. subintegerrima (Vahl) Fernald (F. lanceolata), but are probably not taxonomically significant.